Is Climate Change Killing the World's Oldest Baobabs? The largest baobabs have largely stood alone, bearing witness to history. Radiocarbon dating shows the oldest of these stout-trunked savannah trees have lived for upwards of 2,500 years, surviving the birth of Jesus, the Renaissance, two world wars, and the internet. But they may have met their match in climate change. A new paper published on Monday in Nature Plants documents the collapse of some of the world’s oldest and largest baobabs over the past 12 years. Of the 13 oldest trees, nine are dead or nearing death. 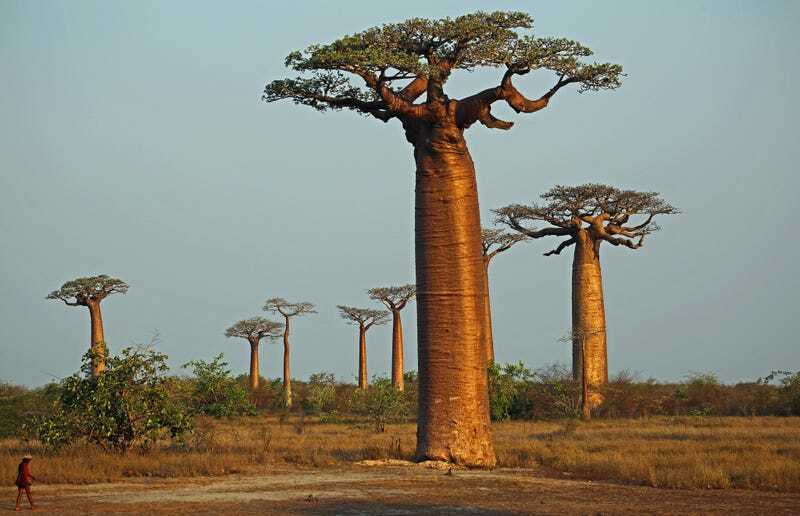 Of the six largest baobabs, five have bit the dust or are headed that way. In some cases, the demise has been rapid. The Chapman baobab stood for an estimated 1,400 years in Botswana, a tourist attraction visible from miles away as its crown reached above the surrounding Kalahari Desert. In January 2016, the tree came tumbling to the ground a day after Botswana experienced its hottest temperature on record. “The deaths of the majority of the oldest and largest African baobabs over the past 12 years is an event of an unprecedented magnitude,” the authors of the new study write. Baobabs grow across southern Africa. The fantastical-looking trees have thick trunks that rise above the savannah, topped by a tiny crown of leaves that look more like roots and have given rise to myth that they’re upside down trees. They occasionally sprout new stems that themselves would be formidable trees. Baobab trunks are also hollow, making them impossible to date using tree ring data like redwoods, sequoias, and other ancient behemoths. But it turns out not all hollow trunks are made the same way. The new study defines normal cavities as ones made through decay as wood slowly rots away, something seen in baobabs and more earthly-looking trees. But it turns out baobabs also have false cavities with bark growing inside them. Those cavities form when stems from the same tree fuse together, and can eventually close up as the tree continues to grow. Adrian Patrut, a researcher at Romania’s Babes-Bolyai University and lead author on the new study, helped pioneer a technique of radiocarbon dating wood samples to get a better handle on their age. In doing so, he found that wood closer to the middle of these cavities was the oldest with some samples dating back to more than 2,500 years. The trees have endured a variety of climatic conditions over that time, but they may be ill-suited to continue living in what Patrut told Earther was one of the fastest warming regions in the world. More research is needed to define exactly how climate change may be influencing the trees. Patrut said the largest trees could be more sensitive to the rising heat because they need to retain more water and nutrients (those resource demands are proportional to their wood volume) while also noting they’re already weakened by age. Looking to the future, climate change is expected to exacerbate baobabs’ predicament. One study indicates that rising temperatures will almost completely wipe out suitable range in Botswana and Namibia. That matters for a variety of reasons, both ecological and cultural. Losing these trees means losing important habitat for animals. Elephants eat their bark and hoover water from the squishier insides, for example. Patrut said protecting the trees from elephants is one way to preserve them, as is reducing the impact of tourism in their immediate habitat. Aida Cuni Sanchez, a postdoc at the University of York who has studied baobabs, told Earther humans have 300 uses for the tree and its fruits, to say nothing of the economic benefits for some bush communities of having these giant tourist attractions. And baobabs are a cultural touchstone, places where people tell stories and help define a sense of place. In mythology originating in Burkina Faso, the baobab’s upside down appearance is because the tree kept walking around, so a god plucked it up and put its head in the Earth. In Congo, a legend tells of how the tree settled across Africa after a tree god tossed it for complaining about the places it initially settled. Losing baobabs means losing these and other stories, along with a connection to deep time.